This piece is a guest post I should have uploaded yesterday but I was elbow deep in matzoh balls. I nonetheless hope you enjoy the below handiwork from the wildly popular blogger behind No Happy Medium, who also happens to be my sister. Had she done just one haiku, Dienu. Tonight my sister will be hosting a seder for the first night of Passover. I love this holiday: You get together with friends and family, retell some of the most important stories in Jewish history, and eat a tableful of food representing elements of those stories. There's also copious wine, and getting to decide who's the simple son. Jessica does a great job each year, but it's a ton of work to get all that food ready, which means she certainly hasn't had time to blog today. She asked me if I'd be up for guest-posting a Passover haiku. Sure thing, Sis. But I'll do you one better. Since you're going to let me stuff my face tonight, and you'll surely provide me with left overs enough for the remainder of the holiday, I'll give you one haiku for each of the 8 days of Passover. There are eight, right? favorite thing about the jews? As tends to happen when its a little gray out, my web surfing to work ratio is pretty high, but all the better to entertain you with. My best find of the day is this post from Eater which features the "Top 10 Most Embarrassing Celebrity Chef Commercials." My favorite is number 3, which I have posted below, with an honorable mention going to number 5. Click through to see the rest. Growing up my mother never baked sweets. Bread, if I was around to knead it for what seemed liked forever, yes, but sweets no. Don't get me wrong, I am not complaining necessarily, only mentioning as a possible explanation of why I have always cooked and seldom baked. (In other words, Mom, no complaints about how I "vilify" you on my blog.) I decided recently, however, that I must learn to do some baking. Nothing touches that inner child in all of us like a visually tantalizing, aroma wafting, luscious dessert and I felt inadequate not knowing how to make one. My baking endeavors began some time ago when Dan had requested I procure a cake of a tombstone for something work related. When I found out how much that would cost I said to myself, "I have watched hours of Ace of Cakes, I'll be damned if some of that didn't sink in." I marched off to the baking supply store and out this bizarre cake came. Like Duff, I don't choose my clients either. Since then I have been going through more butter, sugar and flour than I ever imagined I would use in a lifetime and have been loving every second of it. Using an electric hand mixer take 1/4 cup of the softened butter and 2 Tbspns of the sugar and beat together in a large bowl, you may also use the back of a spoon to help. Recipe adapted from an adaptation of Anna Gosetti della Salda's Le Ricette Regionali Italiane for Torta di Mele. Bourbon. Coffee. Caramel. Bacon. Popcorn. What's not to like? This kitchen sink confection by Liddabit Sweets out of my native Brooklyn, New York, is deliciously addictive. 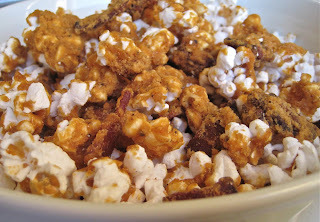 I didn't detect any coffee when I tried it, but the popcorn is a wonderful canvas for the love affair between the smoky bourbon and bacon flavors and the seductively sweet caramel. This treat, as well as other sumptuous offerings, are available at the Brooklyn Flea, a handful of local shops and restaurants, and directly from the source through their new online store. These products are handmade and use as many organic and local ingredients as possible, so feel less bad about eating gobs and gobs of candy. I wasn't planning on posting about this but half way through eating the below plate I decided the What's She Eating Now-reading public should know about this little secret. It involves kumquats, a little known member of the citrus family. Allow me to introduce you. Kumquats look like little tiny oranges but sort of oblong and are usually sold in a plastic clam shell similar to a pint of blue berries in the supermarket. You can eat them whole and the taste experience is quite unique: the rind is super sweet and the inside is incredibly sour. After you pucker at the extreme sourness you are tempted to eat just one more because your taste memory is craving that sweetness from the rind again. Pucker. Repeat. Dan loves kumquats. Personally I have a love hate relationship with them. Love the sweet. Hate the sour. But they are oddly addictive so I keep eating them anyway. But recently a peace maker emerged. A pastry chef friend of mine who taught me a little trick with kumquats that makes them more appealing to the masses and easily incorporated into savory or sweet dishes: preserved kumquats. The resulting preserved kumquats are tangy but not overly sour and can be used in savory or sweet dishes. My pastry chef friend used them in a dish that involved an olive oil macaroon with rosemary ice cream. Delicious for sure, but I went for something a little more simple, fennel salad. I sliced the fennel through a mandolin and coated lightly with olive oil, salt, pepper, and some freshly grated Pecorino Romano. Then I cut the preserved kumquats in half again (so in the end they were quartered) and added them. Often one sees fennel salad served with oranges or grapefruit but this is a lovely citrus substitute and an easy dish to make for guests which seems like it was much harder to make than it was. Enjoy! OK Lori Mason and Daniel Angerer, you have provoked me to break my posting hiatus. For those of you who haven't been following this bizarre gastro news story, Chef Angerer of Klee Brasserie in Chelsea recently blogged about cheese he made from his wife Lori's breast milk (see "Mommy's Milk" post and make sure not to skip the comments section). Why are people so curious and why all the clamor to try it? I can hardly imagine people foaming at the mouth to try any other bodily fluid expelled from a stranger. Perhaps it is because they do not know where to get good cheese and are flocking to Angerer for what they think may be the lactose Holy Grail. This is probably not the reason, but believing it will help me sleep better at night. So in an effort to help address this apparent crisis, I am sharing a few of my favorite non-breast milk cheeses and some shops where you can find them so you don't feel the need to resort to options from Chelsea's human dairy operation. Nettle Meadow Kunik This cheese is particularly interesting because it is a mix of goat and cow milk, which gives it a lovely balance between tangy and creamy. Kunik's flavor is mild in intensity but rich in flavor and its grassy notes are complemented by a butter and honey bass line. 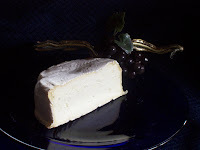 Kunik makes a wonderful first batter on any cheese plate because it is mild enough to preserve the pallet, but at the same time thought provoking and savor worthy. Tomme Crayeuse This cheese is among my most cherished, but also unfortunately holds the honor of being among the most expensive (currently $31.99/lb at Murray's). To set expectations, a cheese habit does not come cheap, but it is worth it, especially if you include some Tomme Crayeuse among your regular go-to selections. 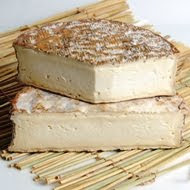 Tomme Crayeuse (or the 'Tom Cruise" of cheese as the label at Murray's jokes), is a French raw cow's milk cheese whose paste is soft but not gooey and has a hint of mushroom in the flavor. The rind on this cheese is not to be missed. It has a lovely texture and a nutty quality which will make you wonder if the rind or the cheese itself is the main event. The only downside of including this winner on a cheese plate is it may very well upstage all the others around it. When buying Tomme Crayeuse look for a designation that it is from Herve Mons on the description. He is the affineur to reckon with in France and his name is synonymous with quality. Spring Brook Farm Tarentaise This raw cow's milk cheese is made in Vermont and for those of you more familiar with European cheeses, Tarentaise closely evokes an Apline style. That means it is a hard cheese that has some pliability and is close in texture and color to a Guyere. This cheese is great on its own or on a plate somewhere between the 12 and 6 o'clock positions. Meadow Creek Grayson This is a washed-rind cow's milk cheese from a family farm in Virginia where they give their Jersey herd the white glove treatment, and it shows in the product. It is pungent and intense, and that is what makes it so delicious. The paste is soft and has a stickiness to it and tastes great on its own or smeared on a piece of bread to help shore up its structural integrity a little. The first time I brought some Grayson into my apartment Dan screamed "What the hell is that? It stinks!" After I convinced him to try it by challenging his masculinity, he couldn't stop eating it. Go get this one now! Grayson is a highly seasonal cheese and after March you may not see it for a while. Jasper Hill Farm Bayley Hazen Blue If you think you don't like blue cheese I encourage you to try it again. A bad blue can scar anyone, but a truly well crafted one will have you tapping the inside of your elbow for your next hit. The Bayley Hazen Blue hails from Vermont and is made by one of the most reputable cheese making teams in the country. The cheese's ammonia blue veins are a perfect match for the sweet pale yellow cream that surrounds them. I consider this among the "no rind left behind" cheeses as well. If you're still a little scared of the blue stuff try it with a little bit of honey but trust me, before you know it you'll be eating this one straight without cutting it with any other flavors. If nothing else I hope this post will dissuade you from pursuing breast milk cheese, but I also hope it will encourage you to start spreading your cheese wings a little. Stay tuned for a future post which will include tips on composing a cheese plate, crib notes to understanding American and European cheese classifications, the answer to when you should eat the rind, and guidelines for selecting accompaniments and pairings. Cheese is a living product. That means it is constantly changing over time, similar to wine. What you try today will taste different tomorrow. Roll with that, it is part of what makes cheese so cool. Good cheese is an artisanal product. That means there will be differences wheel to wheel. Cheese is made from animal milk. That means it will taste different seasonally depending on what the animals are eating, and also that it may only be available certain times of the year depending on the animals, how they are raised, when the cheese is made and how long it ages. As you develop favorites learn about their seasonal variations. When buying cheese I like to think of a serving as about an ounce. As I mentioned, cheese changes over time and usually not for the better so I would err on buying smaller quantities more frequently. Your monger may bristle as you hold your thumb and forefinger up to indicate "a little smaller please," but stand your ground. Murray's cheese: Murray's is the standard bearer of cheese in New York City. They have 2 locations for your convenience, one in the west village and one in grand central. In addition to a monstrous selection of cheese, they also boast top notch chacuterie, a bevy of artisanal food products, and a host of non-cheese dairy products. Be prepared for sticker shock, but they only carry the very best. For those not in NYC, they do online/mail order. Lucy's Whey: Lucy's Whey was born in East Hampton but recently opened an out post in Chelsea Market. Their selection is smaller than Murray's and focuses on American artisanal cheeses but they take the utmost care of their inventory and their cheese is always in excellent shape. The place is small so if possible go on off-hours for best service. Saxelby Cheesemongers: Anne Saxelby is a Murray's alum who struck out on her own and out of her small stall in the Essex Street Market she sells a very nice selection of American farmstead cheeses. Formaggio Essex: While Saxelby covers off on American cheese in the Essex Street Market, Formaggio maintains a small selection of European cheeses. They don't have that much so a trip just to go there may be unwarranted, but if you are nearby the staff is super enthusiastic and helpful, the cheese is good, and they have other interesting food finds as well (including some in the form of samples!). Wholefoods Market, Chelsea. Heresy you say. Up until recently I would have said so too, but lately they have upped their game. They are buying a much better selection of cheeses, taking much better care of them and all of a sudden the cast of mongers can actually answer questions about the cheeses and make worthwhile recommendations. Last I visited you could even get Twig Farm cheese there, a favorite producer of mine that isn't even carried at Murray's. I am keeping my guard up but so far I am liking what they have done with their cheese program.